Along our path to success, we have been featured in many articles and on television. The following features our "moments of fame"! 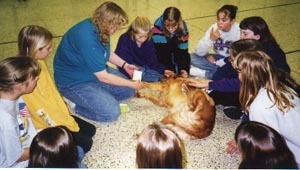 Helping the Girl Scouts to earn their pet badge. One of the things that our mobile practice has allowed us to do, is to participate in many animal related events and educational programs. The mobile unit is an excellent tool that allows us to reach out to the many children who dream of one day being a veterinarian. The following page details upcoming events that we are participating in, as well as animal -related events that you can enjoy. If you are interested in having us speak to your organization or students and live in our service area, please contact us!